Association. All the leading exporters are members of JPEA. The Cultured Pearls Quality Inspection and Tag System is not only for the members but also for outsiders. All kinds of pearls presented for inspection will be evaluated. Japan. Only long experience in this business can tell the quality standards. The new Cultured Pearl Quality Inspection and Tag System is thus designed to help the trade to boost sales and to allow retailers and consumers to buy cultured pearls with greater confidence. consumers will be able to see for themselves that the strand they are purchasing has met the Quality Inspection Standards of Japan. With loose pearls that are either undrilled or half drilled, individual stickers (a different form of tag) will be affixed to each bag of pearls containing one or more loose pearls in it. will be evaluated on the following criteria and either passed or rejected. Master Pearls prepared by JPEA are kept at Kobe Inspection Office, and available for everybody to see on demand. All pearls will be inspected for thickness of nacre. Pearls with nacre so thin that the core nuclei can be seen through the nacre will be rejected. Pearls with low luster will be rejected. Pearls that are strongly permeated by calcite and organic matter, resulting in muddy gray, brown or blue colors, will be rejected. Pearls that exhibit excessive amounts of blemishes, such as bumps, pits and scratches, will be rejected. Pearls that exhibit visible cracks in the nacre or on the nuclei will be rejected. Pearls that display any signs of nacre peeling or chipping will be rejected. Pearls exhibiting signs of damage from bleaching or dyeing or which are judged to unstable in terms of permanency of appearance and quality, will be rejected. 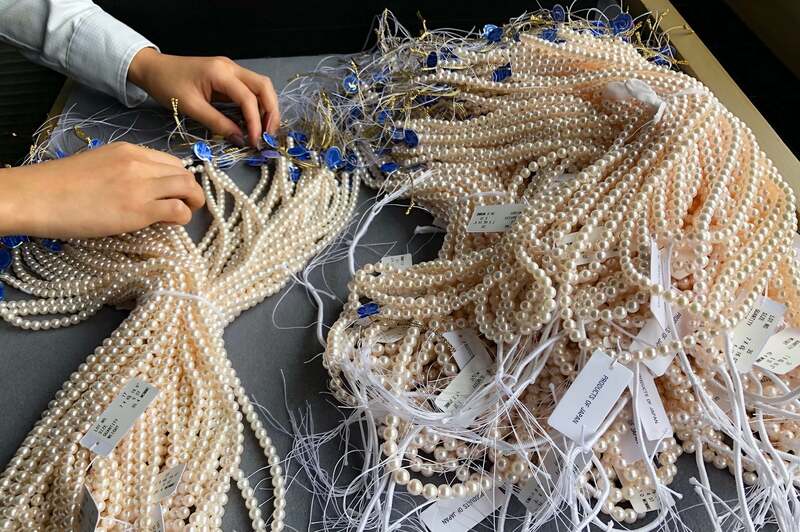 Pearls which display characteristics of uneven dye methods or over-dyeing resulting in excess dye residue on the surface of the pearl, will be rejected.